The integration of a vision system is rarely as simple as mounting a lighted camera on a bracket along the assembly line and plugging it in. Don’t subject yourself to the “Quick Quote” risk! 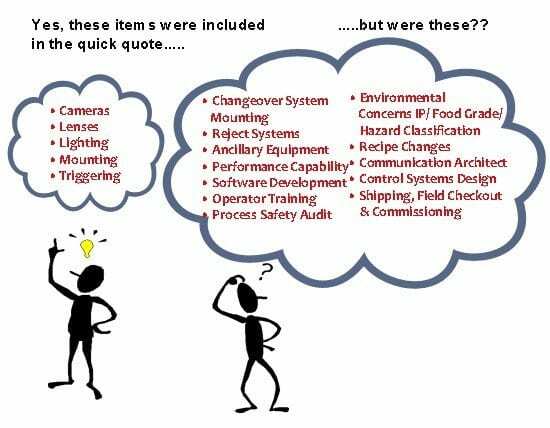 A company willing to provide a “quick quote” may include all the major components and ancillary equipment with their quickly-developed quotation. On the surface, this may seem like what you need, but in reality it is potentially doing you a disservice. EPIC conducts front end engineering for each vision application before moving forward with full vision system quotation, design and fabrication. Based upon your objectives for quality and accuracy of the camera inspection system, FEE pinpoints the most efficient approach to your project. In EPIC’s state of the art vision lab, our group of vision engineers work with you to understand your machine vision measurement goals. From this understanding, we configure a simulated vision application to recreate your manufacturing environment. This real-time testing uncovers the best approach for a custom vision system that will be designed/engineered for robust long term reliability. Camera Selection: Camera selection for ran optical inspection is based on several criteria including the type of application, price point and scanning approach. Lighting Selection: Lighting is fundamental to the success of any vision inspection but it usually takes testing in a vision lab to determine the best lighting solution. We understand that not every client requires fixed bid quote upfront for an optical inspection. Maybe your project is scheduled for the next year, and you just need a rough order of magnitude (ROM) quote for budgetary reasons. It is also possible that you need a +15%/-5% bid instead of a firm +0%/-0% fixed bid. If you are unsure of which FEE method is the best fit, contact one of our custom machines engineers to guide you in the best direction.